'I only catch what I can't identify,' the stranger said, explaining it was sometimes necessary when finding something new or so similar to other species that you could not determine what it was there and then. The elderly couple out walking their dog asked him how he was able to tell the difference. "He dissects them, probably," Sherry cut in. "Dissects them?" the woman asked, looking astonished. "Surely not?" "That's what people do. Nowadays, people shouldn't have to do that to find out what something is." The man with the net did not deny the allegation but showed an avid interest in what Sherry was doing, moving closer to the butterfly she had been patiently tracking. "What is it?" he asked eagerly, by now incurring displeasure from all quarters. He must have had very thick skin. "A very common one: you won't need to dissect this one." I did not pay him much attention at first, absorbed (as I often am on our walks) in my own world of quiet contemplation. I saw the net he held, the sort of net you would associate with primary schoolchildren researching pond life: scooping out tiddlers and tadpoles, pond skaters or water boatmen, emptying them into ice cream tubs and clear jars, watching them swim or skate or row around, and then happily releasing them back afterwards. But there were no ponds nearby that I could see. The drop to the River Erme was steep and the water gushed as it might through a gorge. Jane and I had gone on ahead, along the wooden boardwalk and round the corner. We were wondering what on earth was taking Sherry so long. Needless to say, she was not happy when she finally caught up and related the whole episode. Only a few of the rarest British butterfly species are legally protected, and sometimes this is no guarantee from people who will stop at nothing to complete their collections. As we walked on past the cascading waters of the Erme to where the river became more tranquil, I could not help thinking a good many things: how all this seemed a throwback to a world I thought we had moved on from; of specimens dipped in preserving fluids; of wings pinned flat and put in drawers and glass cases. The Victorian lepidopterists did not have the luxury of digital cameras to record the species they observed. True, the man we saw was doing nothing illegal but the act of catching (and particularly collecting) lepidoptera today seems wholly unnecessary. And butterflies enjoy such a brief taste of freedom that it seems an excessively cruel and cowardly act to cut their lives short. If, for instance, many of the inhabitants of Ivybridge, the town less than a mile downstream, engaged in this sort of nefarious activity would there be any butterflies in this area(common species or not) left to see? With that sobering thought I walked on, and savoured the fact that the Silver-washed Fritillaries dashing about on the wing in sunny glades were safe in deep, scrubby brambles, out of reach of the longest-handled nets. Down on the ground, we found fungi among ivy and mosses. Time to consult the experts! If I thought moth identification involved a great amount of time and patience, it seemed a breeze compared to telling different species of fungi apart. Different specimens of the same species can vary on colour, size, shape and form. This was where the second edition of Roger Phillips's superb Mushrooms came in handy. And I did not have to look far - there was a very similar-looking specimen on the front cover. These mushrooms are common and edible but with my level of expertise I would never dare pick one, let alone eat one! 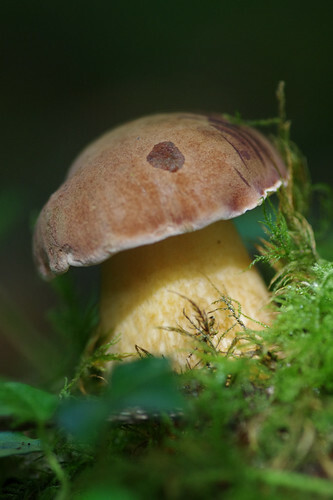 One of the bolete mushrooms - difficult to tell which one! The specimens above were growing amongst mosses and had sprouted from an old stone wall. 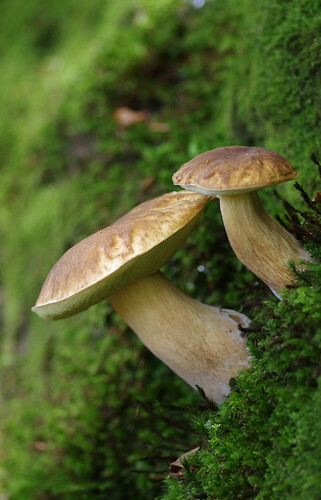 They don't possess lines called gills underneath and have to be one of the boletes. The one on the left had a pasty shape which made me feel peckish. Moments before, we saw a deer. 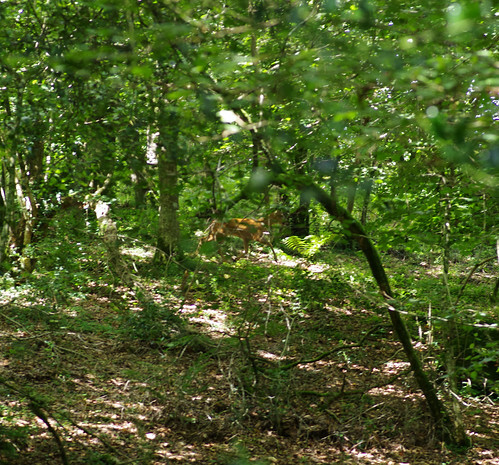 We stopped and stood stock still and stared, and the deer regarded the clumsy human statues before trotting off. It was too far away to capture closely with a macro lens on the camera but close enough that we could hear it running and the faint hollowness of its hooves. The fungi on the mosses could have been a marker because our path led away from the river soon after, inland and uphill. Even though I followed the map diligently and tracked the muddy, boggy footfall of those who had gone to and fro before us, something felt not quite right and we splashed and sploshed on into the boggiest places where no path seemed to exist. Eventually, we threaded our way through and found a path off to our right at the top and heaved a huge sigh of relief. Back on firmer ground and not to be outdone, Sherry captured this creature. I don't think we had encountered this species before. 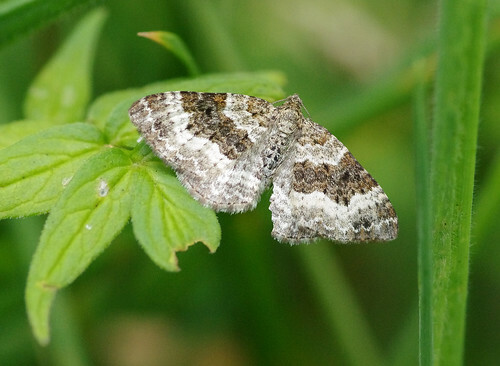 The distinctive colour form made it much easier to identify afterwards than many of the other carpet moths. 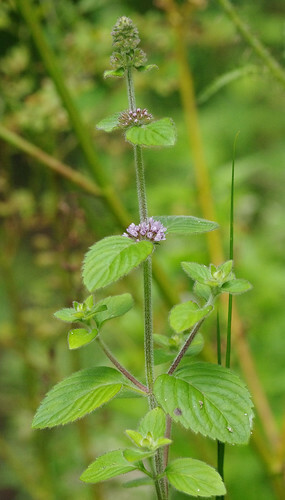 I'm guessing this is whorled mint because the emerging flowers are in whorls and the leaves are roughly the right shape. We found a few of these growing near a trickle of water and further along in damp grassland. 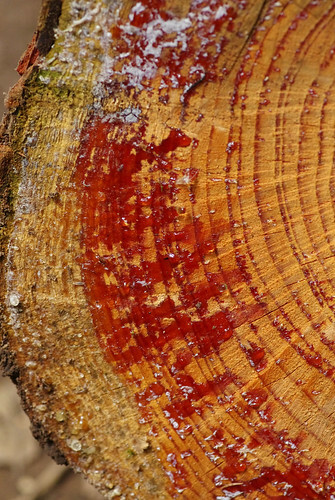 Our route from here led up through a small wood where tree-felling was taking place (the freshly-sawn cross-sections of logs looked like they had been bleeding). We traversed a field and passed a couple walking in the opposite direction, who said we would need stilts. This seemed an odd thing to say and I noticed that the man's trousers did not look particularly muddy. We continued down to survey the dip in question and found that it was easily navigable. Little did the couple know they had more testing trials ahead. We sat on the grass in the blazing sun, in the lee of a stone wall to eat our lunch. Then before crossing, we tiptoed into the tussocky grasses in the corner of the field to see what hidden wonders fluttered among them. 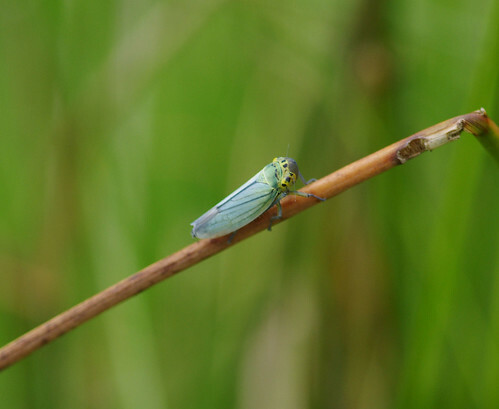 There were whitish micro-moths on the flowers of grasses, grasshoppers perched on the stems and these colourful leafhoppers were everywhere. After crossing the stream, I noticed four flies (a family, perhaps?) 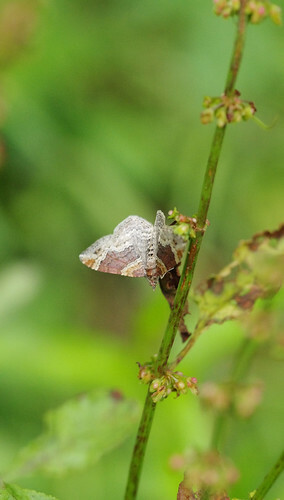 perched on the same plant in formation, all at roughly the same angle and seemingly ready for take-off. Further up the track, we were fortunate enough to be treated to a dazzling sight. 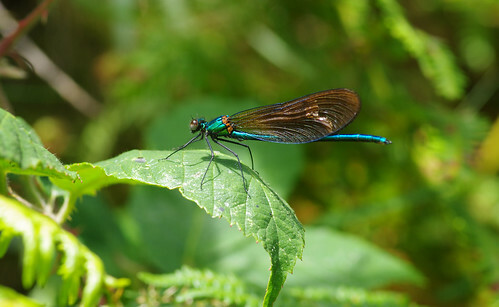 These damselflies are commonly seen during the summer months but you could see the colourful spectacle a thousand times and still not fail to be lifted in spirit! 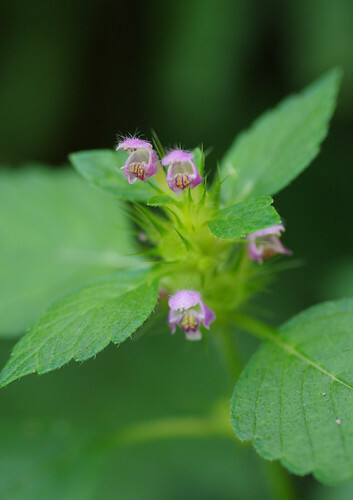 At the end of the track, we followed a country lane and found these hemp-nettles growing in the hedge. We turned off left at Hall Cross, along an old lane with a line of tall, majestic beech trees growing on top of a stone wall. Rays from the sun caught individual trees and turned their trunks white. Hanger Down was completely different to how I had imagined it. 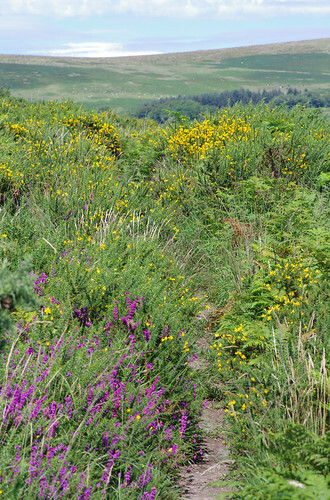 Even after looking at the map, I did not really register the gentle contours and expected a wild and rugged heath with gorse and scattered hawthorn trees, their branches distorted into supplicating poses by unforgiving winds. Apart from the small, round clump of trees away to our right, Hanger Down was like a large expanse of grazed land. We looked at another micro-moth we could not identify, fluttering low in the grass and moved on, intersecting the centre of the down and then veering left slightly so we left adjacent to a reservoir building, our path funnelling into a lane overgrown with nettles and brambles and understandably popular with Red Admirals, Small Tortoiseshells, Peacocks and Wall Browns. Looking across Hanger Down towards the open moor. Henlake Down was smaller and considerably wilder with encroaching bracken and gorse bushes. We kept to the path at the edge and I felt compelled to climb a tree - something I haven't done for years. Well: climb is perhaps being a tad over-generous. The long limb was bent almost to the ground and I stepped sideways up and sat in a perch not more than twelve feet up, gaining a new sense of perspective and appreciating how different the world seemed; looking at the oak's old trunk and the lichens festooned like tinsel and hung out to dry. Buoyed by the experience, I did not want to get down or go home just yet. So when there might have been a path through the undergrowth, dropping down to the woods and the river, I chose to ignore it and we made one last deviation, braving the prickles to carry on around Henlake Down until the next exit left, dropping down back towards Ivybridge and the end of our walk. 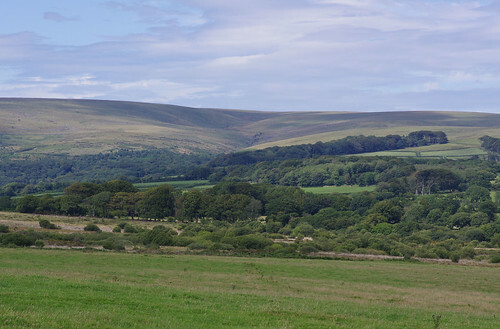 View from Henlake Down towards the open moor.